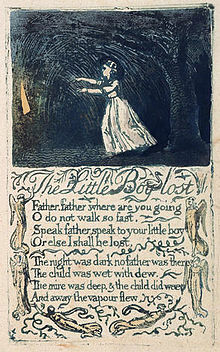 "The Little Boy Lost" is a simple lyric poem written by William Blake. This poem is part of a larger work entitled Songs of Innocence which was published in the year 1789. "The Little Boy Lost" is a prelude to "The Little Boy Found". The Little Boy Lost begins with a boy walking behind his father and asking the father to slow his pace so he does not get lost. In the illustration that accompanies the poem, the child is actually following a dim light (referred to in the poem as a vapour). Night comes and the little boy is lost walking in soggy ground,covered in mud, and weeping as the vapour flies away from him. Upon the publication of "The Little Boy Lost" and Songs of Innocence, people of Blake's time perceived the compilation of poems as a children's book because it was easy to read, the poems were very short, meant to be sung, and were accompanied by colourful illustrations. In modern times, however, much deeper understanding of the poem has developed. One can not analyse a poem by William Blake without noting its themes that come from the Christian faith. Some interpret the poem as representing the relationship between humans and our spiritual lives with the Biblical God. The father represents earthly pleasures that we might end up following. A person can become lost in a spiritual journey by acting on impulse; following drugs, a lavish lifestyle, or anything else that goes against Biblical principles. Like the little boy covered in mud, adults who have followed the wrong "god" to a life of sin are covered in that sin and completely lost. "The Little Boy Lost" is a two stanza poem with eight total lines. There is no set metre but it is similar to common metre. In the poem Blake uses internal rhyme in line 7 “The mire was deep, & the child did weep” with the words “weep” and “deep”. This played a role in the simplicity of reading the poem. The use of caesuras throughout the poem also contributes to the easy reading, giving the reader a chance to slowly read and take in the words and meanings. The repetition words, such as “Father”, put an emphasis on the meaning of Father in the piece. The title “Father” serves the use of ambiguity, because one may interpret different meaning from the word. The poem itself is ambiguous, because it has its literal meaning and religious meaning. Blake incorporated symbolism in line 9 “And away the vapour flew”, “vapour” symbolise the “Father” from the beginning of the poem. ^ "The Little Boy Lost and The Little Boy Found." University of Buckingham. N.p., n.d. Web. 04 Dec. 2013. ^ Holloway, John. "An Excerpt from Blake: The Lyric of Poetry." N.p. : Edward Arnold (Publishers), 1968. 20-76. Rpt. in Children's Literature Review. Detroit: Gale, n.d. Literature Resource Center". Retrieved 5 December 2013. This page was last edited on 29 August 2018, at 13:29 (UTC).